a new venture due to be launched soon, you too can host the dinner party experiences like no other. (Did you see what I did there? Any marketing company executives reading this, know that I’m open to offers). 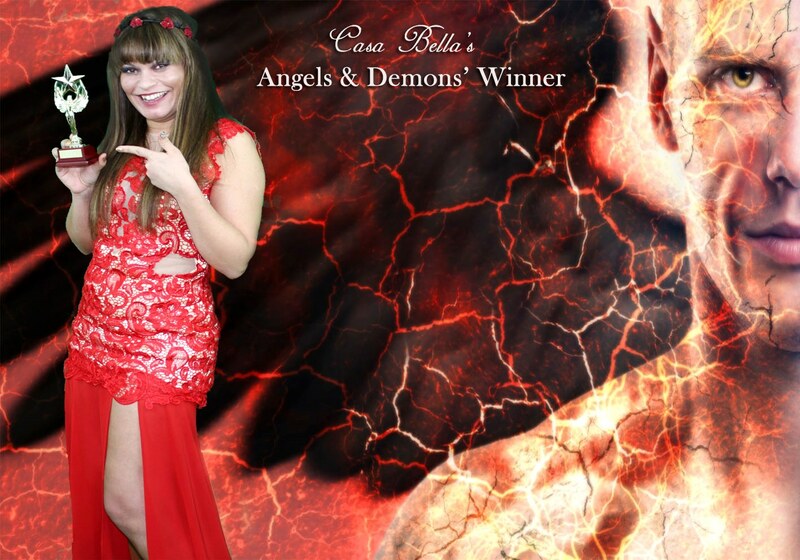 It took a few months to devise Casa Bella’s Angels & Demons. 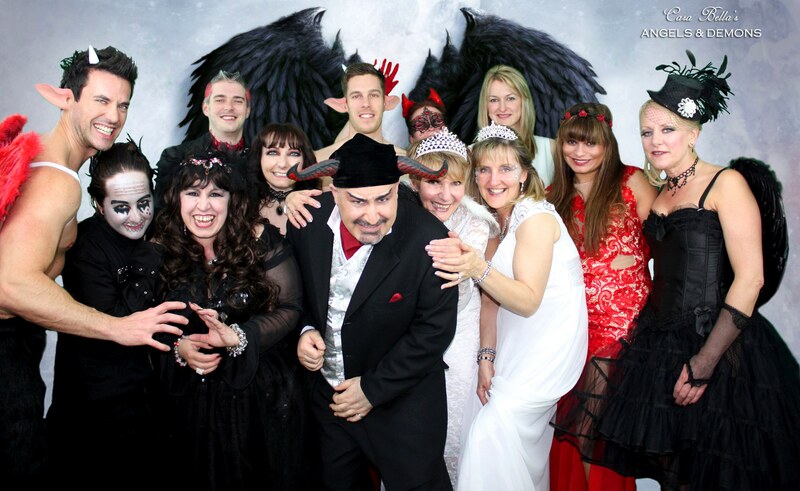 Everything from the evening’s format, design, quiz element, score keeping, catering, wardrobe and look had to be considered, including how exactly to shoot and give guests souvenir photos of themselves in their own angelic or demonic setting. The logical choice for the evening’s official (and souvenir) photos had to be today’s movie studio preferred of green (or blue) screen technology. It meant rigging a whole room once more with green walls and a lot of post-production work but I knew I’d be able to get the results I wanted. I then enlisted the help of my co-hosts to shoot a series of images based on a specific photoshoot schedule and camera setup devised by me. No, of course I’m not a control freak and I resent the implication! 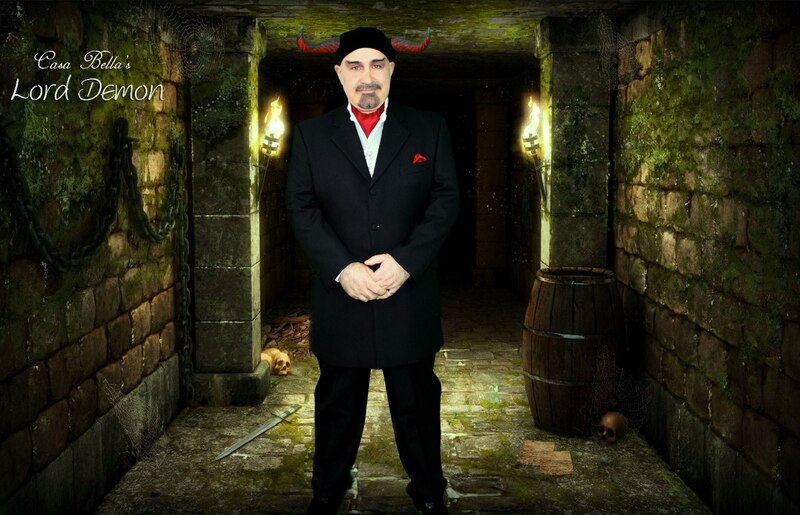 Well I did want to shoot the pictures myself but I was otherwise indisposed, ensconced in the main event room with another part of the Casa Bella crew, otherwise known as the Lord Demon’s slaves, as I didn’t want our guests to meet/see any of us until the right moment. I often say that the hours leading up to each Casa Bella event are often the most stressful because there are always last minute things that haven’t been, should have been or can only be done minutes before the doorbell rings. In this case, there were no less than 40 miniature bulbs suspended by fish wire over the dining room table, over 20 candles, and various small up lighters that needed firing up moments before the gusts actually walked into the room. It had all of the elements for a real stress fest. Yet, it wasn’t. Okay, so there were a few false starts where guests were on the verge of being ushered into the main dining room prematurely but other than that, my trusty sidekicks and I were on top ‘fawn’, no that wasn’t a typo, more about it below. tinged wither demon red or angel blue. 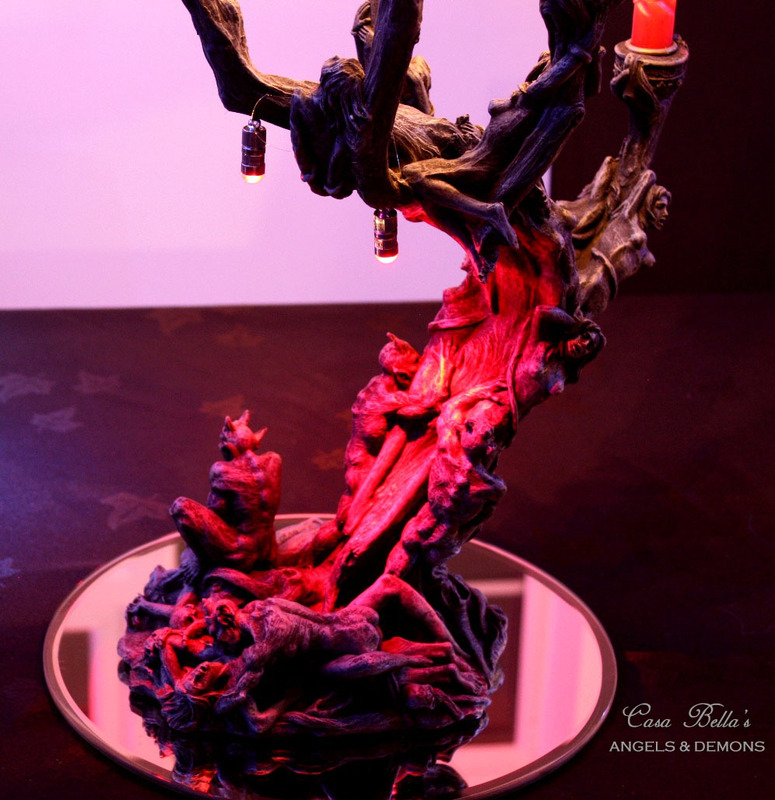 One by one, the guests, albeit somewhat apprehensively took their seats at the Lord Demon’s table where my new, somewhat pricey, pride a joy stood as a centrepiece; a black candelabra featuring hand carved detail of naughty demons performing very naughty things! 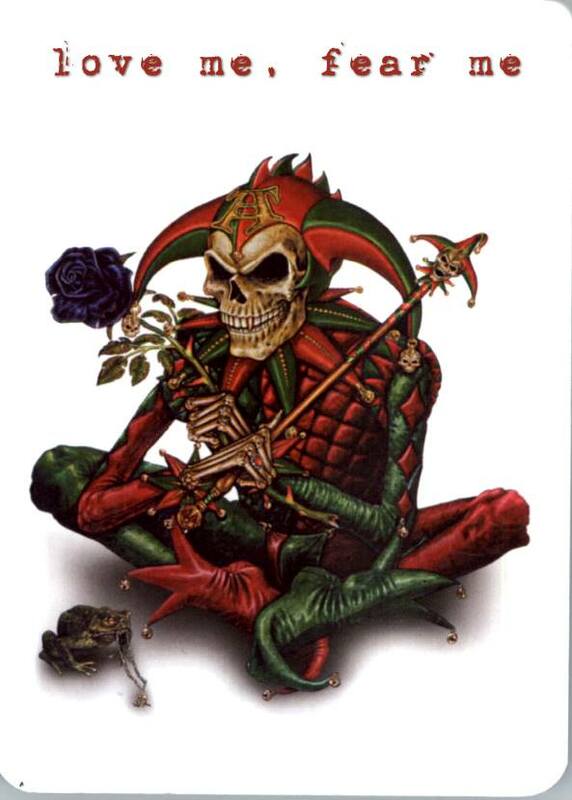 The table was adorned in black cloth, a smattering of miniature pagan charms, silver stands laden with bread rolls, drinking glasses and carafes of water. It soon became obvious to me that, when it came to costumes, both the Angels and the Demons were coveting the evening’s BEST COSTUME as many had made a real effort. So, the scene was set; the room, the angels, the demons, the Lord Demon and his fawn slaves and the pounding of the drumbeat music I specially selected for the evening, it thumped in the background like the score to a tribal sacrificial offering. I almost expected everyone to strip off their clothes and dance around the table as if it were Stonehenge… or maybe not. Anyway, I read out the evening’s schedule in my best commanding voice along with the rules of the game designed by me specifically for Casa Bella and for you (if you’re feeling evil enough), Link details to the Angels & Demons party theme and game will be added below when they become available. Devil’s Dinner Party (and Devil’s Diner Party 2) type moral dilemmas, each determined by a randomly selected Gothic playing card. 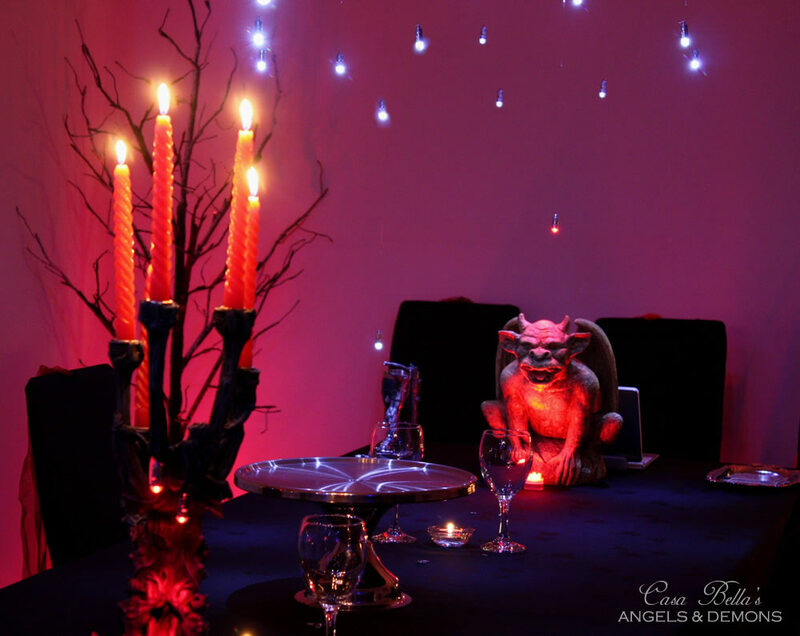 Although the gasps didn’t come until guests learned of the real sting in the Lord Demon’s tail; guests would not be spoilt by the usual Casa Bella’s hospitality, featuring free flowing food and alcohol, but would instead only have access to the bread and water on the table before them. Now I should stress, for the record, that the devil in me took no delight from sharing this news with guests who I know traditionally avoid food in anticipation of a Casa Bella event… oh OK, maybe a little. I reconcile the format change to the fact that, along with its hospitality, Casa Bella also has a reputation for ‘mixing things up’, we really would hate for our guests to ever become complacent, it would ruin the anticipation any future events, although I don’t think there’s any danger of that ever happening, especially after this dinner party event. Now, I’d be lying if I said that I didn’t used any of my experience studying human behaviour as a backbone when designing this event. Whilst one of the primary objectives was to ‘mix things up’, do something that hadn’t been done before and something our guests would never expect, at least not from us hospitable, bona fide Italians (which just happens to be Latin for ‘good faith’ – no pun intended), I also wanted our guests (friends) to get to know each other a bit more so I introduced some personal questions or conundrums where each guest would have an impossible choice of looking out for themselves or for the collective team. This element is something you will have experienced and or heard of at corporate team bonding experiences around the world. Let’s not forget that most of the people at this table were already friends (although some would say that we tested that state of affairs), and it would be easy for them to ‘assume’ they knew each other really well. What this experience proved was that you never truly know somebody, there are always elements of ourselves that we do not expose unless presented with specific set of circumstances. I did precisely that. The result was an evening of friendship, team bonding, comradeship, discovery, laughter and the collective and personal will of each and every one of the guests to succeed, win the Lord Demon’s purse and the trophy! The most suspenseful part of the evening though had to be when Selina Daley, a Demon that had been previously voted off by one of her fellow demons, was actually resurrected (as part of the game via a resurrection card) and then went on to become the evening’s champion! Yes, the demons did win the evening but not by much. It was then Selina, one of the sexiest demons, who, with the most credits and before the stroke of midnight, was declared winner of Casa Bella’s (and the first ever) Angels & Demons. Selina proudly took home a trophy to prove it plus the evening’s total purse of a whopping £30 out of a potential £130.00. Oh okay, so maybe they didn’t do that well but it was enough to pay for the taxi home! It was after the evening’s winner was declared that everybody was invited to vote for the evening’s BEST COSTUME. 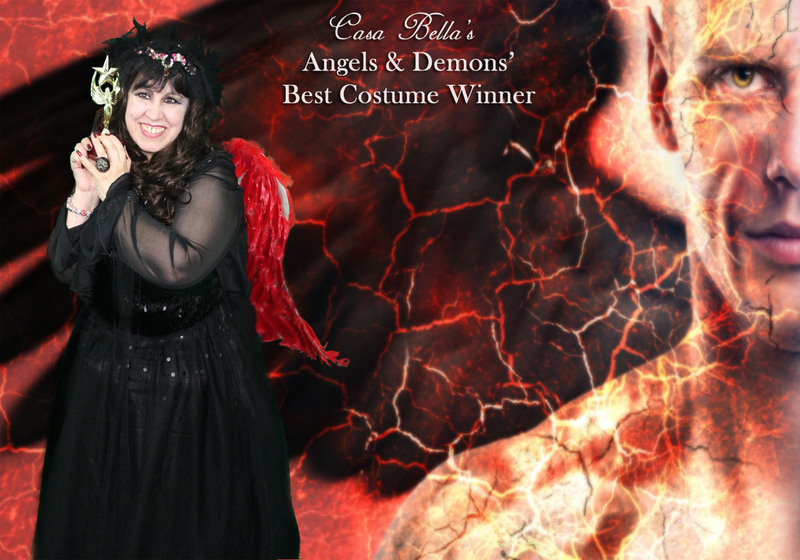 It was a very close call but it was none other than my very own sister and fellow co host, Francesca Marturano-Pratt, who was declared BEST COSTUME WINNER of Casa Bella’s, and the first ever Angels & Demons dinner party. Needless to say that Francesca, who as hostess of the numerous events staged at Casa Bella, has always played the part of bridesmaid and never the bride was absolutely thrilled with her win. Both of these lovely ladies were very worthy winners as you can now doubt tell from the big smiles on their faces. It was then, of course, being a gracious Lord Demon I ordered all of the food and booze to the table for everybody to enjoy, right before we took part in shooting a series of hilarious group photos, some of which you see here. 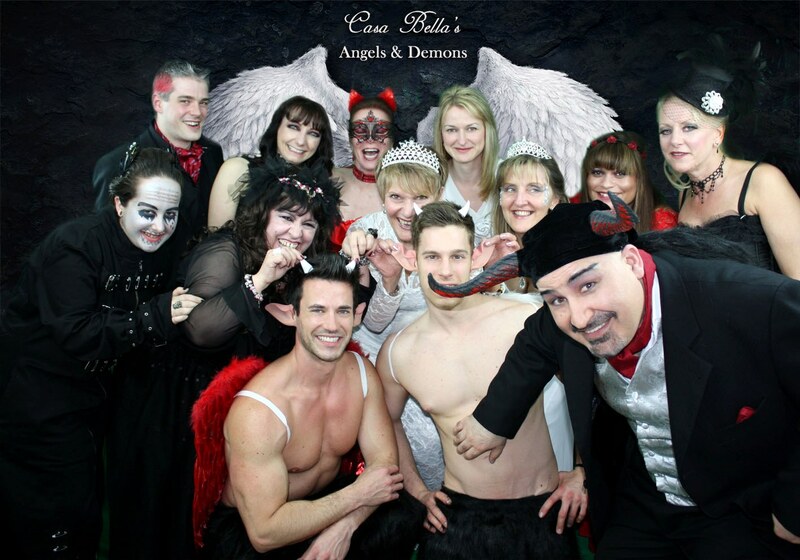 Not unlike all of Casa Bella’s events, Casa Bella’s Angels & Demons was a labour of love. It took months of planning for just a few hours that disappeared in the blink of an eye, For us, this is inimitable, unforgettable quality time with dear friends. After all, you can have drinks down the pub or even a meal out any time of the year but how often do you get to dress up as an angel or a demon and have this immortalised in a series of impressive photographic souvenirs ever seen from a dinner party experience? Photos that we’ll be able to cherish for years to come. these same experiences with their own family and friends is a true honour and privilege. I can only hope and we’ll work hard to ensure that these events will bring them as much, if not more, of the joy each and every one has brought us. Spaces for Casa Bella’s next event, CASTAWAY, scheduled for the 6 September 2014, were snapped up on the first day of their release. Spaces for the 10 year anniversary of Casa Bella scheduled for the 20th December 2014 (which just happens to be my birthday) will be released soon.